With the nuclear industry set to double its workforce over the next decade, there has never been a more important time to ensure professionalism across the sector. Many more “nuclear fit” employees will be required to meet needs of the nuclear new build programme and the long-term demands of operations and decommissioning. The nuclear industry expects people who work in the sector to understand nuclear specific standards and requirements, especially the importance of nuclear safety culture, nuclear security culture and nuclear technology and safety. The industry needs individuals who can develop and grow and who want to follow a recognised career pathway and route to professional accreditation. The Nuclear Institute, as the professional learned society for the nuclear industry, is committed to meeting these needs and building professionalism across the industry. To this end we developed the Nuclear Delta® which provides clear standards and measures to support nuclear professionalism. We use this standard as the benchmark to assess nuclear professionals and to drive professionalism at all levels. Achieving the requirements of the Nuclear Delta® is central to professional membership and accreditation by the Nuclear Institute. What is the Nuclear Delta®? The Nuclear Delta® sets out the competences and behaviours, which are required by the industry and which differentiate nuclear professionals from professionals in other fields and institutions. 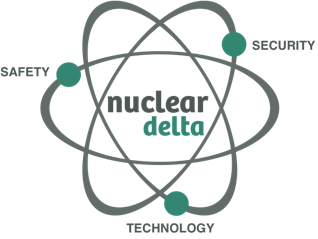 The Nuclear Delta® is defined by three core elements, which capture what is unique, special and different about the nuclear industry. Why is the Nuclear Delta® important? The Nuclear Delta® provides the pathway to professional accreditation and recognition within the nuclear industry. It is the recognised benchmark used across the industry. The Nuclear Institute uses the Nuclear Delta® standard to assess Member (MNucI) and Fellow (FNucI) applicants. By demonstrating the requirements of the Nuclear Delta® scientists, engineers, technologists, safety, security and business specialists can become recognised nuclear professionals. Individuals must demonstrate the competencies and behaviours defined within the Nuclear Delta® to qualify for professional membership of the Nuclear Institute and to receive the title of nuclear professional. The Nuclear Institute works with the National Skills Academy for Nuclear (NSAN), the industry’s lead strategic skills body, to deliver the requirements of the Nuclear Delta® through professional membership and joint approval of training and professional development programmes, including apprenticeships. Download a copy of the Nuclear Delta® standard and the Nuclear Evidence Guidance.